SOLD as of February 2, 2018). "Asking Price - $798,000.00 (FS)"
Pacific Ocean, Ala Wai Canal, City and Mountain Views. Rare find: Penthouse on the 33rd floor in Fee Simple. 2-Bedrooms, 2-Baths, 2-Lanai, 2-Parking stalls and 2-Storage lockers. In the middle of Waikiki, makes it convenient to Waikiki Beach, International Market Place, Waikiki Zoo and the Aquarium. Close to Kapiolani Park: Tennis, Soccer fields, jogging paths, and the Waikiki Shell for concerts with International stars performing. 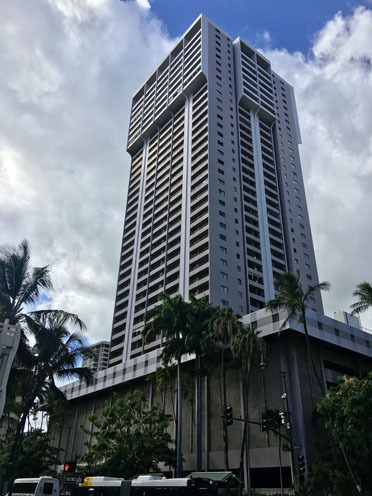 Elegant dining, shopping and entertaining at the best clubs in Hawaii are within walking from your Penthouse at the Royal Kuhio. Interior Area: 1,243 sq.ft, plus the two Lanai: 251 sq.ft., for a total of 1,494 sq.ft. Total Monthly Fees/Charges: $1,573.00, / Plus: Property Taxes: $178.00/month (2016). Bedrooms: Two / Bathrooms: Two / Covered Lanai: Two. / Covered Parking Stalls: Two. Royal Kuhio House Rules Aug 1, 1996.
taken from inside #3307, a view of the building, views to the Ocean and to Waikiki. eMail: Copy & Paste this WaltFlood@gmail.com into your eMail server. You must obtain written permission to use any content, including pictures, on these pages.